Parvin Dabas’s directorial debut “Sahi Dhandhe Galat Bande” is an attempt to mix comedy with a burning issue, but the final output of this, is not satisfactory. The movie deals with the issue of Real Estate Mafia in a modest way. The movie which could have been an out and out entertainer, fails miserably mainly due to poor screenplay. The dialogues, which remain a quintessential part of a comedy movie, go ordinary here; which is another prime reason behind the failure. The story has undoubtedly a huge potential to turn a blockbuster, but lack of treatment says it all. The main limelight of the movie was Parvin Dabas the actor and Parvin Dabas the director. Sahi Dhandhe Galat Bande is an honest attempt made at a very good issue. The film has solid direction, descent performances and okay-dokay music. However, the film fails because of loose editing, mild treatment and dazzling screenplay. Overall, the movie is a onetime watch if you like something out of the box. Parvin Dabas is phenomenal Vansh Bhardwaj is impressive. Anupam Kher underplays well.And the rests are good. Story by the director himself is the most positive prospect of the movie. Screenplay is okay. Editing is loose. And Cinematography is brilliant. Sub urbs of Delhi are well captured. Music by Dhruv Dhalla and Siddharth - Suhas is okay. Mast Kalandar and Naino Wali Whisky are good, rest is bad. Very good direction from a debutant. Though, this one was not a master piece, would love to see more from you Mr. Dabas. 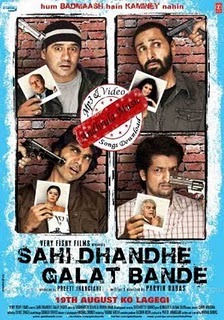 Sahi Dhandhe Galat Bande is not so sahi movie and not even a galat attempt, it is a one time watch.